So, last night I tried to document my preparation for my two First Lego League teams. As I wrote in the previous post, I was a rookie coach with two rookie teams so I had spent a lot of time checking through documents from the First website but still really felt like the teams weren't really getting the guidance they needed. Part of it was that I was also very busy with other responsibilities both at work and at home. Anyway, I had registered both teams for the Novar Gardens Regional, which was to be held a week after the PAC Regional as a result of more teams entering FLL for the first time. There were about 40 teams lined up for the PAC event, and there were 18 teams in the Novar Gardens one. I recall thinking that this was good as that meant my kids wouldn't be overwhelmed and overrun by experienced teams who really knew their robotics. Even so, I told both teams that our main goal was to have fun and enjoy the experience - by now, everyone was pretty confident that their Robot Game score wouldn't be zero! The Novar Gardens event was held at Immanuel College where a long, long time ago I was a student. In FLL, each team gets allocated an area to call their home for the day, commonly known as "the pits". These were all in the Margaret Ames Centre, on the site of the old boys boarding house. An interesting sidenote is that Margaret Ames was my Year 12 English teacher - I have said in the past that no teacher in my education inspired me to become a teacher but in her case, she was definitely one of the better ones. It helped that I liked English. We put all of our gear in the pits area and I went over to the Coaches Meeting to get the lowdown on latest rulings in the Robot Game, how the practice table areas could be booked and where to find every part of the day's schedule. We were reminded to remind our students that judges were always on the lookout for examples of Gracious Professionalism ™ so teamwork, helping out others and being thoughtful were aspects outside of the actual robotics that would determine how teams fared on the day. Marg, my principal, came along for the day and luckily so as I soon found that trying to juggle two teams was an extreme challenge for one coach as two different schedules meant some clashes where I could not be in two places at once. After an opening ceremony, both teams got to have a practice Robot Game on the competition tables in the Century Theatre. Then the day was up and running. I attended with both teams at various times to go to their three judging sessions. These sessions are held with the team and coach only in the room - no external spectators. Even though both teams had these in differing orders, I will recount them as if it was sequential. Both teams had to present their Research Project to a couple of judges. Splice Cubes tackled their human based water problem on the issue of the lack of fresh water in the world. Their research told them that about 3% of the world's water is fresh and two thirds of that is frozen. Their proposal was to mine icebergs and melt that water and transport it to countries where water is in short supply. The judges asked some probing questions about their concept - what would be the effect on the world's climate if this were to happen? H2Flo tackled water contamination as their issue and had created a 3D printed filter prototype. Again, some probing questions from the judges kept them wondering if they needed more depth in their research as their presentation was quite entertaining. From my perspective, both teams did a reasonable job but I felt that their research needed more depth and their solution needed further development. Another session was the Robot Design Judging session. Both teams had developed relatively simple robots that were devoid of sensors. H2Flo went with the mantra that their design embraced the "simple is better" philosophy with less to go wrong. Our coding experts were able to talk to the judges about their strategy for tackling the various missions. Splice Cubes had build a squared off structure using Lego beams on the back on the robot to assist with more accurate mission launches. For this session, I felt that Splice Cubes had the edge. After all, in the week leading up to the Regional, their robot was regularly scoring between 50 and 90 points in practice sessions. They also had more mission runs up their sleeve; the result of the time that the girls in their team had invested during their break times. However, at one lunch time the H2Flo robot went on a spree where everything clicked and the robot scored a hypothetical 95 points. I still thought that the Splice Cubes robot and coding was superior and that would show out in the Robot Games still to come. The final judges session was the Core Values session. The task was for the team to build a tower as tall as possible from Lego in two minutes, have it measured by a judge and then break up it all up and return it to the box in pieces ready for the next team. The judges also asked questions of the team - how did you come up with your name? What is the best part of FLL? What is the most important thing that you have learnt? It was in this session that H2Flo really clicked especially when Jimmy (remember him from the past post?) responded to the last question by saying that he felt that the most important thing he had learned was teamwork as prior to this, he didn't really know any of his team mates all that well and they were all very different people but through teamwork they had come together to share the common goal of being committed to the team and doing their collective best. This was really cool and when I look back at their team, of the nine kids who came on that day, there were four different religious backgrounds represented and five different cultural backgrounds as well as being balanced gender wise. Then there were the three Robot Game matches. This is the spectator friendly component of FLL and is probably the hook that gets kids interested in the first place. Marg streamed all of the matches to our school FaceBook page which was great as I missed three of the matches due to the judging sessions. This was pretty close - in these matches only the best of the three scores counts towards the final outcome. Splice Cubes managed a credible 55 points as their best and H2Flo slid just past them with a 60 point best effort. This had the two teams at fifth and sixth place at the end of the matches - which we thought was pretty good for first timers. The best score posted was 130 by a team of high school students but the smaller field at this Regional meant that the big scores we had seen on YouTube weren't happening here. Once again, the teamwork of H2Flo showed through after a disastrous second robot game where nearly every mission failed. The student who had designed most of the coding was beside himself and was very upset, feeling that he had completely let the team down. Sitting down in misery, he was quickly surrounded by his teammates who all did their best to assure him that he had done his best, they were all right behind him, these things happen so don't worry and maybe the robot just needed a fresh battery. I don't know if any judges saw this but the team surrounding and supporting their colleague was super genuine and could well have been the biggest learning moment of the day for these guys. Mid-afternoon was the time for the closing ceremony. After a demonstration from a FRC robot, and some obligatory YMCA dancing, the hosts and judges had results ready to announce. My two teams were sitting back, relaxed as they had met their goal of enjoying the day. Sitting next to Marg, I said to her, "You know, even though it doesn't matter, it would be pretty cool if one of the teams won a trophy. It would really raise the profile of Lego League in the school and help with STEM hype." The next thing I know, they were announcing that H2Flo had won the Judges Trophy as the most consistent performers throughout the day. The kids were so excited as it was so unexpected! I felt for their Splice Cube colleagues as they too had given the day their best shot but they were sporting in congratulations for their jubilant team. I was very pleased - the rookie team had worked like a team all day and had been recognised and the Lego trophy was very cool. A bigger surprise was still to come as the announcements wound to a conclusion. "Before we announce the day's Champion who will be invited to compete at the National Championship in Sydney, we will announce the second place getter who will also be invited to go to Sydney. That team is .... H2Flo!" As the kids screamed and leapt to head to the front of the theatre, Marg and I looked at each other and thought, how are we going to pull this off? The rookies from the disadvantaged state school had exceeded all expectations and now an enormous opportunity sat in front of us. Could we get organised in time? Would parents support it? So, as we headed back to the pits to pack up for the day, my head was swirling with what might be possible. 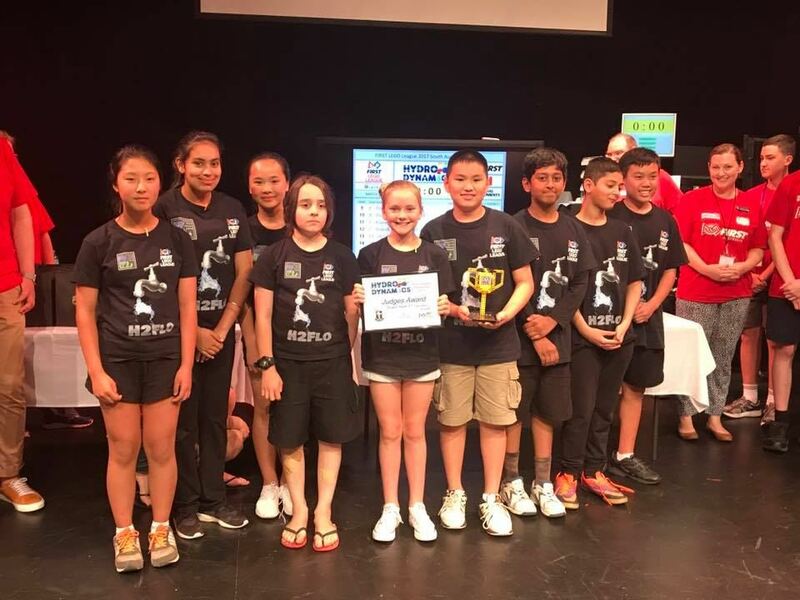 I had seen the email reminder a few weeks earlier that alerted all teams to the National Championship but I had binned it, never thinking that either team were going to gain anything but experience from their first FLL foray. Once the excitement subsided on Monday, we had some serious decisions to make before any promises could be made. Posted in Programming, STEM on December 9, 2017 by Graham.